This is a story about the erstwhile Christus of the Chapel of the Holy Cross in Sedona, AZ, and the Chapel itself. The Christus was there for more than 20 years, and then it was taken down and destroyed, while the Chapel remains a landmark in the small town in which it resides. Here's a bit about both. How the Chapel came to be built is an oft-told story, and one which is readily available to this day in that place. It is sufficient to say that a generous benefactor named Margarite Staude was the catalyst and bill payer of the Chapel, and enabled its ground-breaking in 1955 and subsequent completion in 1956. Mrs. Staude was a patroness of the arts and a sculptor, and dedicated the chapel in memory of her parents to "Finding God through Art." Being a good Roman Catholic she gave the building to the Diocese of Gallup, whose Bishop was Bernard T. Espelage, who then assigned Father John Driscoll as the priest to the then new mission church. The chapel was built during the "hot times" of the Cold War, during which there was a television series called "I Led Three Lives." The main character of the weekly program was a man named Herbert Philbrick, who began each week's episode by saying something like, "My name is Herbert Philbrick, and for 20 years I led three lives. During that time I was an husband, an American Citizen, and a counterintelligence spy for the FBI." In a peculiar sort of way, Herbert Philbrick's multiple identities is a bit like the Chapel of the Holy Cross, as it, too, has had three very distinct lives. Here's a bit about each one of them. For a number of years the chapel was the parish church for the local Roman Catholic people. Sundays the faithful would gather, and it was - in an architectural sense, anyway - a uniquely different experience for both the locals and also the few folk who constituted the "tourist influx" of the day. Stories were written about the chapel in Life Magazine, the New York Times and Washington Post, and Arizona Highways did a piece on it in the July, 1957, issue. Things went along swimmingly for a few years, as priests came and went, the faithful attended Mass regularly, souls were fed, and all was "hunky-dory". Or was it? Four quotations from the guest book of the chapel during that first year give us some insight. The first two observations seem to come from Christians and share opposite opinions, the third possibly from an architect/philosopher, and the last quote may have been penned by the first New Ager to come to town. - "The Chapel is beautiful. I also think the Crucifix is beautiful as it gives me the feeling of the terrific agony our Lord went through for us." - "The Corpus denies the resurrection of Our Redeemer. Christ's body was never in such a state of decay." - "Magnificent in concept and execution. A shrine to live in the heart of the wayfarer as long as the memory of this superb setting lives." - "The view around is beautiful but not the Chapel. The Cross is atrocious." What about this cross, or more correctly, the "Christus", as the sculptor called it - which used to hang over the Altar of the chapel? "A piece of such work should have many meanings for as many views. It is intended that way - I could only list what I know are starting points for these many meanings and many people. "Actually, the piece, of itself, went beyond me in intention and meaning to points of which I am only dimly aware. "One starting point - the opening in the body - a great wound, Christ's, and the world's for crucifying Him. Two - the blackness of the interior - so that perhaps the space and depths within are limitless to infinity. Three - the extreme attenuation and tension of the figure and the strain and agony of the whole piece - pain - the pain Christ felt as a victim and as a conscience for the men who could do such violence to their Lord and their brother in time past and present. Brother still crucifies brother - a continual nourishing of agony and violence. The open mouth is, of course, a protest and a call to end this inhumanity. "The viewer should be horrified by this aspect and be moved to ends of peace and humanity by it. Reaction, even against this piece, is good. It must have its effect. Man too often is more anxious to escape facing his guilt and inhumanity - to favor a more relaxed superficial attitude. The Church is a power for peace and love, but it must be a militant power, outraged by outrage, strong and clear in protest to inhumanity, aware of and sympathetic to the agonies mankind suffers every day. "It is difficult to verbalize about a visual statement such as the Christus - but I am, believe me, reassured even by the most violent rejection of it. What would mean death to me would be indifference - not rejection. then I would feel I had failed to bring about a real work." The Christus became known as the "Christ of the Atomic Age," and so it hung there, from 1955 until some time in the late 1970s, suspended from the concrete cross, acting like a good sermon - comforting the afflicted and afflicting the comfortable. Things began to change, and the congregation wanted to build a church in town, instead of being "way out there" in the cow pastures. And so they did, and the chapel stood empty and uncared for for a period of time. In 1963, the second life of the chapel began, through the work of a Discalced Carmelite priest, Fr. William McNamara, who made his home in Washington, DC, at the College of Our Lord of Mt. Carmel. Father McNamara spent much of his time on the road giving lectures and conducting retreats. A peculiarly fascinating character, through chance he bumped into Mrs. Staude during a California lecture in which he was telling of his dream to create, as he put it, "a House of Learning and Leisure somewhere in the West." He did just that in 1963, when he took over the chapel from Father John Whitney. So the Discalced Carmelite journeyed to Sedona, put up a shack in the rocks near the chapel - or so local "folklore" tells it - and began his ecumenical ministry under the banner of "The Spiritual Life Institute". Arriving in 1963, he was like a Cold War rocket shooting up into the sky with a blast of light and noise, and ecumenical lectures began to take place. In January of 1964, Fathers Whitney and MacNamara were joined by Fr. Damien Goggins, a prominent priest of the Dominican Order. With Father Goggins' arrival, Whitney was freed to concentrate more fully on the ministry of the local parish - Saint John Vianny's Church - while MacNamara and Goggins did their thing on the red rocks by the cows - all with the Atomic Christ looking down at them from His Cross. 1965 was a great year for MacNamara and Goggins and the Spiritual Life Institute. The Quaker theologian Douglas Steere spoke on the need for contemplation, and the year was capped off with a national CBS television program at the Chapel on Christmas Eve, which was billed as "a unique Christmas Eve all-color TV program "[called] "Tell It On the Mountain", starring folk singers Chad Mitchell and Judy Collins. However, those times, they were a-changin', and so, too, the chapel. Even though the next Christmas Eve would witness a Midnight Mass at the chapel, celebrated by guest priest Fr. George Duff, a Servite from Anaheim, CA - that's where Disneyland is, you know. - things began to get curiouser and curiouser at the chapel. Yes, there was an Easter Vigil in 1968, and Holy Week services in 1970, but the chapel became less and less a place where the faithful gathered for sacramental worship, and more and more a place where other things happened, instead. By 1974 it was all but over. On September 5-6 a program of dance and theater took place, and was the third in a series arranged by Marilyn Francis, the then "Cultural Director for the Chapel." There was also a poetry reading by her that year, as she read her "Rivers of Remembrance," accompanied by music and special visual effects. Father MacNamara's interest in the chapel was also waning, as he acquired land further out of town and, finally, the chapel came back under the direction of Saint John Vianny parish and its pastor, Father Vincent J. Nevulis. 1977 witnessed the beginning of a Cultural-Spiritual program, with various artists bringing in their works for exhibit. Father McCarthy subsequently became the pastor at Saint John Vianny Catholic Church, and under his watch, and unbenownest to him, the act which signaled the end of the second era/life of the chapel took place: the Christ of the Atomic Age was taken down and spirited away one day, never to be seen again. No one knows for sure what happened. When I first began my examination of the chapel - a holy week several years ago now - no one wanted to talk about the Christus. In fact, one person who knew the story quite intimately simply said, "Mrs. Staude didn't want me to talk about it, so I'm not going to." 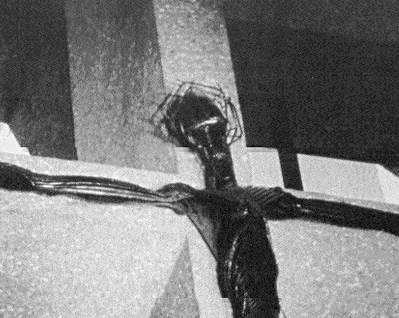 What is the local folklore about the Atomic Christ? Apparently Mrs. Staude finally had enough of the controversy about the Christus and so, one weekday she and her handyman came in from Los Angeles, went over to the chapel and removed the Christus altogether. With the Atomic Christ having been removed, worship services faded, until finally the decision was made not to hold any more regularly scheduled sacramental services at the Chapel at all. This policy remains in effect today. A HOUSE DEDICATED TO "FINDING GOD THROUGH ART"
There it stood - a cold, concrete, empty, uncared-for albatross around the neck of the bishop and diocese. Someone, however, had the idea to clean up the place and put a gift shop down in the old priest's quarters in the basement and had, in fact, started this process even before the Christus was destroyed. Lo and behold, people came. They took pictures, lingered a while, looked around a bit, and even bought some of the little trinkets that were for sale downstairs. And the gift shop ministry has grown to the point that not only is the Chapel of the Holy Cross solvent, but is, no doubt, quite a financial asset to the Catholic Diocese of Phoenix, which now owns the building. And so it stands today - sanitized and devoid of that offensive Christus, a "smoothed-out" declaration and monument to "finding God through Art..."
But what is it? It has no regularly scheduled services. There are no resident clergy present to counsel and encourage, to hear confessions, to offer the Holy Sacrifice. It seems that the chapel has focused almost solely on the gift shop, and on the fast-moving tourist, who is a slave to time and demands mementos of his journey through life and his visit to a very beautiful part of God's creation which we call "Sedona, AZ." Is the chapel a modern-day equivalent to Mars' hill and its devotions "TO THE UNKNOWN GOD?" Time will tell. However, there is a timeless message for us all. In our day, individual suffering is "out" and living a "feel good" life immersed in temporal extravagances is "in." Such indulgence is very 1990s, to be sure, but is not at all helpful in one's trek to sanctification, holiness, eternal life. We may like our crosses to be of gold, pearls and precious stones, but it is only the crucifix - the Atomic Christ or any other, for that matter - that shows so intimately the Passion of Christ, and tells us the Truth that "to love is to suffer." "Christ of the Atomic Age"
"The Chapel of the Holy Cross ... stands like a cross planted in the heart of a volcano, an upright beam of concrete resting on massive out-stretched arms of red rock. The interior... is small and yet conveys a feeling of immensity.... Dominating the view from the window, a great white cross stands in front of the altar. Nailed to this cross, a black, tormented Christ looks down through hollow eyes. "One kneels. One crosses oneself. One dares not look up at this strange and terrible figure. One looks out through the enormous window and thinks: The builders had no need for stained glass. God has stained the scene in this window with colors man can never reproduce. He has sculptured a scene beyond man's artistic feats. "But it is not possible to distract the mind from the black figure of Christ, racked, stretched on the rack. One casts brief, hurried glances upward. It is too cruel for contemplation. "One turns away, observes one's hands clasped in prayer, but not before one has seen the feet, the black, swollen, unbeautiful feet. "Why do Your feet look like that? Have You been carrying this cross back and forth over a burning earth where no cool stream remained to ease those poor feet? Is that the atomic burn that nothing can ease, that burns and swells and blackens and still burns? "What an atrocious cross!" a visitor, who has gone hastily outside, remarks. "Atrocious! It denies the resurrection of our Redeemer." "In his book The Everlasting Man, G.K. Chesterton says: `There is something appalling, something that makes the blood run cold, in the idea of having a statue of Christ in wrath....' [but] The figure of Christ which hangs in the Chapel of the Holy Cross in Sedona is not a statue of Christ in wrath; it is even more insupportable to the imagination, because it is a statue of Love physically ruined; and what is more insupportable than the image of Love Embodied tortured, burned, blackened and ravaged? Looking at this Christ... can one believe that this promises the resurrection, that Easter must follow, as inevitably as the day the night, this Good Friday? ... "When St. Augustine was converting the Britons, the Indian peoples were building their cliff-dwellings and pueblos here. When Saint Thomas Aquinas was writing his famous Summas, these cliff-dwellings were being abandoned to fall into the decay in which one sees them today. A civilization born, a civilization dead. Old Indian cities still remained when Coronado came through searching for the seven cities of Cibola, and while Shakespeare was writing his last plays, Franciscans were establishing a mission in the old Hopi village of Oraibi, scarcely a hundred miles from this disturbingly modern chapel with its atomic-age Christ. "Here, in the midst of an old story, a new chapel rises in the ancient shape of the cross. Inside the chapel hangs the Christ of modern men, the Christ of the atomic age - blackened, ravaged, yet like the green-forested lava spilt round about, promising the new green life of the resurrection. "Walking down the ramp away from the Chapel of the Holy Cross, back to one's car, the thought that predominates is just that: a figure burned, tortured, blackened and ravaged, yet still promising the resurrection. Can He still want us? Can He still love us? "It seems that He does."